There is a depth and wisdom to Lina Hanson, celebrity makeup artist and founder of Lina Hanson skincare, that belies her youth. And after hearing her story I see immediately where such wisdom and vibrant energy comes from. 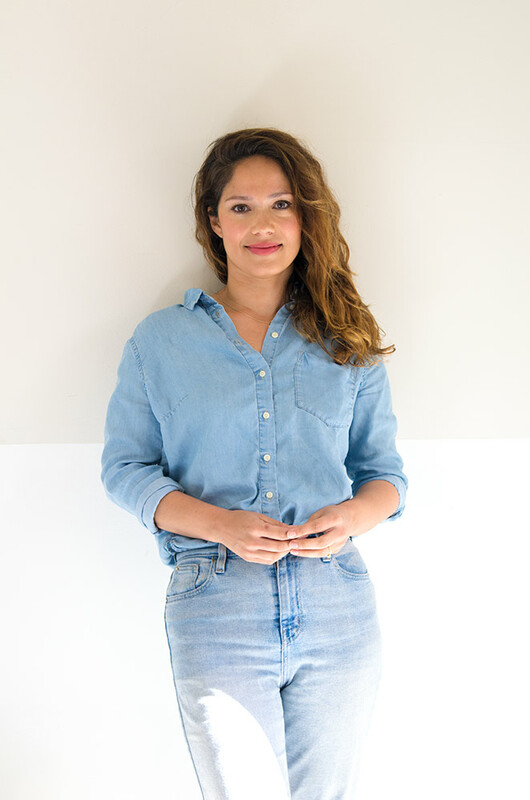 The well travelled skincare founder opens up whole heartedly about her story, that includes loss and mystery, and explains how an appreciation for nature, animals and people are all components of her gorgeous skincare line. Lina’s energy vibrates through her products, which I cover in an earlier review. But for more on how this Swedish, Pakistani woman hopes to help women rediscover and embrace their natural beauty and give back to charities along the way, read on. I grew up in a small town in Sweden. I always felt very safe. I was always out in nature. We had the forest, the lake and in the summer I would go out and pick berries. I felt a strong connection to nature, and I had amazing friends and my family. But growing up in a small place like that, I always felt different. I looked different than everyone else. So, I think that was what inspired me to travel and get out and see what else was out there. I left Sweden and moved to London when I was eighteen. I moved there by myself, but I knew a couple of friends who lived there. I lived there for three years, but my dream was to go to New York. I loved R&B, hip-hop and soul music and for some reason I felt like a lot of that music was coming from New York City at the time, so I always wanted to go there. I felt so inspired and there just seemed to be so many opportunities there. It was so different from what I knew and I loved but I wanted to try something different. Once I moved there I ended up loving it so much I stayed until 2006 before coming out to LA. When I moved to London I had never been there before. When I moved to New York City I had never been there before. I just made this decision that I’m going to do it and love it. That was always my thing; let me at least try it and if I don’t like it I can always move back home. My mom was Swedish and my dad is from Pakistan. I’ve never met my biological father. My mom passed away when I was four, so I grew up with my grandparents on my mom’s side who basically became my parents. It was all I knew at the time. It was difficult but I think having my grandparents there helped me. I felt so much love as a kid and I feel like that really helped me to become the person I am. They were so supportive and willing to let me explore. I always had my own ways and wanted to travel, and they were, like, yah that’s fine. They were willing to give me so much freedom. A few years ago, my sister contacted me. She contacted me to let me know that I had a sister on my father’s side that I never knew. It’s been so amazing. We have such a great connection. She lives in Sweden, so every time I go back I visit her. And it’s like I have this new person in my life. In a way, it kind of filled a void. I feel like I have her now and she doesn’t have any contact with our father either, so it’s kind of like we are in this together. If we decide to find him, we can do it together. It feels so special to have her in my life. When I moved to London I was working in a Benneton clothing store. I was kind of into fashion. I didn’t get into makeup until I moved to New York City. I was in school at The Fashion Institute of Technology in New York. I was styling a little bit, doing press shoots and I was very intrigued by what the makeup people were doing on the shoots. I ended up meeting the founder of Stila Cosmetics. She was a makeup artist. I started doing personal assisting for her and she encouraged me to learn how to do makeup so, I started assisting her. She taught me how to do makeup. I never went to makeup school and she kind of liked that I didn’t go to makeup school so she could teach me. I had fresh eyes. I learned from watching her. I got really into it and started doing photoshoots. I got signed with an agency and then moved out to LA and got into celebrity makeup. I still do makeup. I try to balance it all. I have clients I have worked with for years; people I love working with. But my brand is my passion. Skincare and wellbeing is more what I’m into now. I started the brand with the Global Face Serum in 2012, and it just grew organically. I’ve launched a product a year. I take time with each product I create. I’m not just coming out with a whole line just to have products. For me, I ask myself – is it missing on the market and is it something I can do better? I’m constantly trying to work on ingredients, experiment and see if there is something that I need to complete the line, but I also believe that less is more. I believe if you can have a product do multiple things, that’s so much better than having fifty different products for your face. Your brand – Global Beauty – what does that mean? The idea of ‘global beauty’ was the inspiration before there were any products. It was mine and my husband’s idea. It’s been a passion of ours. I grew up in Sweden; my dad is Pakistani; my husband is Kurdish; I’ve lived in England and New York; and so we just we feel we are global citizens. We travel all the time. And I feel like working in Hollywood as a makeup artist there is this stereotypical idea of what beauty is: the skin has to be perfect, you have to look this way and you have to use these products. Growing up in Sweden in a small town I looked different from everyone there and it always made me wonder, oh, is this supposed to be beautiful or is this? Working and traveling made me realize there are so many different types of beauty that need to be celebrated. There are so many different colors and shades and shapes, and why are we so fixated on this one certain type. So, that was the inspiration from the beginning. To embrace and help women embrace their real beauty more so than trying to fit into this idea of what beauty is. Where does your product inspiration come from? When it comes to the ingredients I get so inspired when I travel. When I get on a flight and I land somewhere I have this invigorating feeling. There are so many ingredients that have been used for centuries by women in various cultures and it was so interesting for me to learn about what they use and know because they know so much about skincare. The Thanaka we use in our Global Beauty Trio I found in Thailand. We spent some time there and I would see these women, especially in northern Thailand and Myanmar, have yellow Thanaka on their cheeks. I was so curious about it. They told me it’s for sun protection, but that it is also great for brightening the skin and clearing up acne. I did some research on it and I started using it on myself. I was, like, this is amazing, so I found a great supplier and we started testing it and working on a new product. I started experimenting with the idea of a powder as a cleanser and mask. This is something that’s very popular in Asia. I thought it was so unique and smart because it doesn’t go bad and you can bring it wherever you go. I loved that idea, so that’s how that product came to be. We have a studio here in LA where we are hand blending and crafting all of our products. Everything is hand made. It’s all fresh ingredients. We are making small batches. We don’t make a ton, so it’s not sitting on the counter for a long time. When you are buying our products it’s as fresh as it comes. And the response has been incredible. I’m so thankful for the response. I create the products from the heart and the whole global beauty concept. It’s so nice that it resonates with people. We are growing a lot, but it’s nice to be able to feel you can grow at your own pace. Currently, you can get the products at Detox Market, Credo Beauty, online at our website, and high end boutiques around the world. We are sold in Europe, Scandinavia, Singapore and Hong Kong. How did you get connected with the charity Change International? My husband is from Kurdistan. His family is there and we went there a few years ago. The refugee crisis is really bad there. We went because he’s a film maker and we went for a film festival. He was showing a documentary. I ended up meeting this woman who was a volunteer helping with the refugees. She’s from Sweden, half Swedish and half Kurdish, so we had this connection. She brought us to the refugee camp and we did a screening of my husband’s documentary film there and it was just life changing. There were a thousand people and so many kids. There was this sea of tension everywhere. It really got me thinking and made me feel like I needed to do something. The woman founded an NGO called Change International, and it felt really right for us to team up with her because we know the money is going to the refugees. Sometimes with these big organizations you don’t really know how much of the money is going towards the cause, but with her I feel safe knowing it all goes there. So, we started the #IAmGlobalBeauty campaign where you take a picture of yourself and you post it on Instagram telling us what global beauty means to you, and for every post we give a dollar to Change International. We are just trying to team up with different charities every few months. I take my time to find the right ones to partner up with. Spending so much time in Kurdistan made me think a lot about the refugees and anything I feel connected to I want to give to. Like, when we started spending time in Thailand and I saw the way elephants were treated. Now, we are looking into an organization there that helps the elephants. We are constantly looking to give back in different ways. We change it up to another charity after a few months to spread some awareness. I think it’s really good for people to learn about what’s going on in the world. I just love southeast Asia. Three years in a row we have gone and spent three months there. I like going to a different place and feeling like I live there as opposed to going on a short vacation. I like to immerse myself in the culture and get a feel for what it would be like to live there. Chiang Mai has become our place we love. Northern Thailand is the place my husband and I say half jokingly we should just move to. I love the culture, the people, and the quality of life. They take time to enjoy life and it inspires me and makes me feel very calm every time I’m there. My time there has definitely helped. It’s nice to spend time away and recharge. I need to get away and have that time because I feel like I can give more when I am here in Los Angeles, and I appreciate it more when I’m here. It’s important. I know if I give myself more, I can give more of myself to the brand. It’s so simple. I don’t use a lot of makeup and that’s also my makeup approach as an artist. I don’t like heavy makeup. I use very light makeup and focus on the skin. I’ll use the Global Face Trio and massage it into the skin and rinse, then I apply the Global Face Serum. Next, I use the Vapour Beauty organic foundation, then I just do some mascara from ILIA Beauty, some cream blush and I love the ILIA beauty lip crayons. Very simple. I think beauty is all about taking care of your skin with great products. When your skin looks nice you don’t have to cover up with a lot of makeup. It just looks better when you let your natural beauty shine through and embrace what you naturally have. Previous Post Ask An Aesthetician: How do I get rid of post-natal melasma?